Wash and then cook the rice, just like you always do. 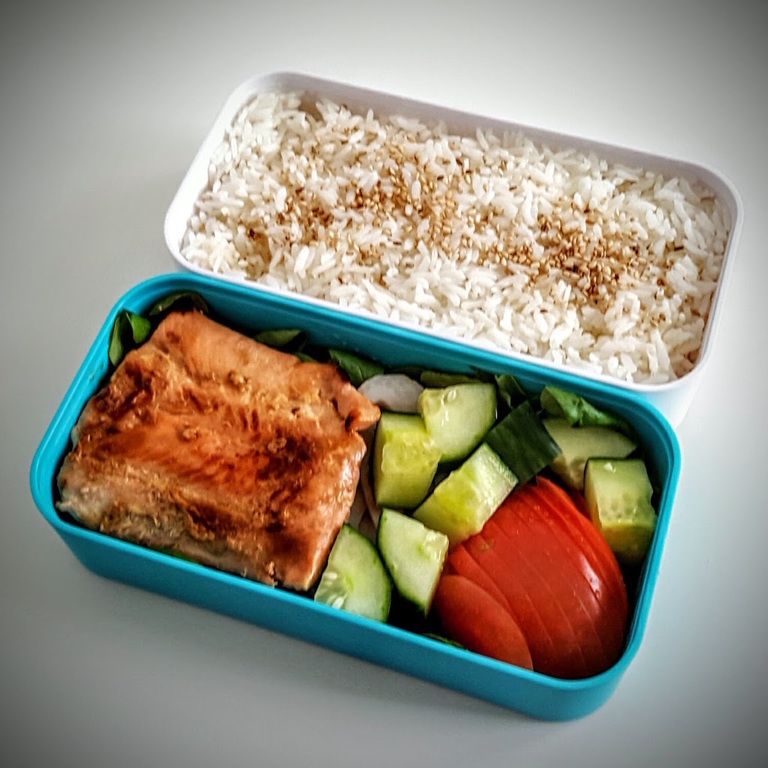 You can prepare everything else while the rice cooks, and fill the bento container with steaming hot rice when cooked. Dry the salmon with paper towels and set aside. It must be dry to cook properly. Set a small frying pan on a medium-high heat and add some oil (1/2 teaspoon, you can also use an oil brush or paper towel to remove excess of the oil). Quickly (about 1 minute) fry the meat, smear some teriyaki sauce on the top side, then flip. 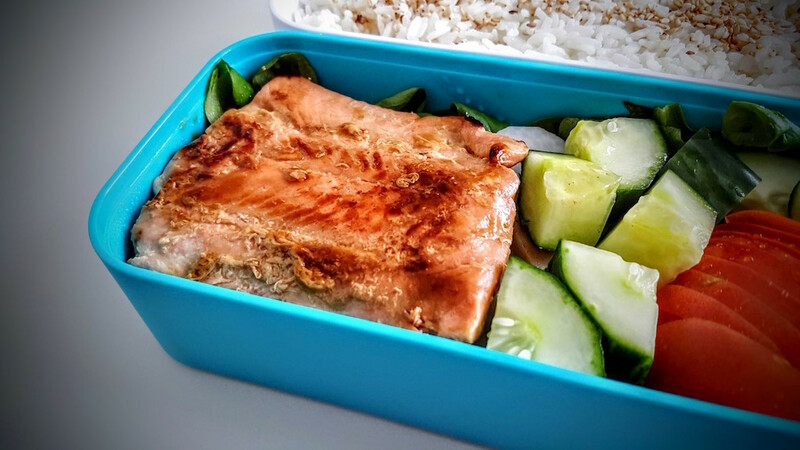 Fry the salmon for another minute while you smear the top (side that you fried first) with teriyaki sauce. Make sure that salmon doesn't stick to the pan, you can shake it a bit. Make sure that both sides of the salmon are cooked properly, you can keep flipping the meat every 30-60 seconds until you are satisfied with the donness. Set aside on a plate and again smear some teriyaki marinade on both sides with the kitchen brush. Let it cool down. Peel and slice the lotus root into 3-5mm slices and wash thoroughly to remove the slime. Heat enough water to submerge all the lotus slices in a small pot to boiling temperature, add 1/4 teaspoon of salt and place all the lotus root slices in the boiling water. Kill the heat and cover the pot, set aside to cool down for few minutes, then take out and wash with a cold water to remove the slime. Lotus root will have a fresh, moist texture and quick cooking it in a hot water will kill any germs. Wash, dry and slice tomato and cucumber. You can also dice the cucumber if you like it this way. Wash, dry and shred lettuce leaves, and fill bento container with it. Place vegetables on top of the lettuce, leaving space for fish. Place lotus root slices and salmon on top, then sprinkle it with few drops of lemon juice.